Back in the olden days of the Internet, I started selling my glass beads on eBay. Sometimes people missed out on an item because the auction ended with a Buy It Now, sometimes they auction ended before they realized. In either case, they missed out. Customers asked if they could be notified when I listed beads, so I started the “Quick List” email list to let people know when I listed new items (hello to you faithful Quick Listers who may be reading this!). A few years later, Etsy came on the scene and I was part of the first beta group for that platform. It solved some of the listing urgency problems and I slid off of my regular Quick List email schedule. So many things have changed since I started out online. Mainly, the invention of social media. That changed the landscape of everything, didn’t it? I joined in – you can find me on Facebook, Instagram, and Pinterest. I don’t have them all figured out, but I enjoy the different aspects of each platform. Today I add one more. Actually a subset of my Facebook page. I took the plunge and… created a Facebook Group. I have resisted starting a group because 3 social pages seemed like plenty. And I didn’t really get what a group would offer that a page wouldn’t. It is easier to follow comments and see if something is available or not. Sometimes people want to follow posts about the art-making process, or DIY tips or photography and not see items for sale all of the time. (I never flood any page with buy items, but still). But What if I’m Not on Facebook?! I hear you. Not everyone is on Facebook, and never want to be. For that reason, whenever I am listing items in my Facebook selling group, I will also post a group photo HERE, on this blog, and you are welcome to email me about purchasing any item you see. As always, items are available on a first come, first purchase basis. You still can! The “Don’t Miss A Blog Post” signup in the sidebar (→) of my blog will sign you up for an automatic email for each new post on this blog. 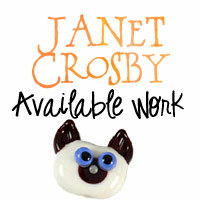 And, if you truly just want to be notified about bead sales only, please let me know and I will set up a separate list. I don’t have the capacity to select what posts go out with the blog post notifier. What About the Quick List? It is still here – Don’t Miss A Bead (also in sidebar). Since I have other options for those who want to be notified of new items for sale, the newsletter will feature special sales and contest announcements and recaps of noteworthy/timely blog posts. I plan to email weekly. I promise no spam and easy management of your subscription in the footer of every email I send. Thank you for your interest. You can subscribe here. ‘Like’ my regular Facebook page. I will post a ‘heads up’ (not detailed item listings) when new items are available for purchase. To receive notifications of Facebook page activity, please see the graphic at the bottom of this page that I created for tips on setting up. Items that do not sell in the “first look” round will then be added to my shop for everyone else. My Facebook group and blog posts will truly be the first look and opportunity to purchase.